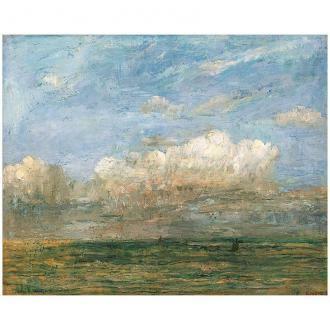 As a child, James Ensor lived on the North Sea for a few periods of time. The parental home on the Langestraat was abutted against a city canal, behind which was the Seawall. Later he lived on the corner of the Van Iseghemlaan and the Vlaanderenstraat, fifty metres from the Seawall. Ensor was thus deeply entrusted to the sea and her light and colour patterns at play with the sun, clouds, fog and wind. After the storm (1880) is one of the first mature paintings that came about after Ensor‘s departure from his academy studies. It is an impressionistic vision of the sea, at the moment that the sun breaks through again after a raging morning storm. In Large Seascape with Sunset from 1885, the clear, humid atmosphere and dynamic from After the Storm gives way to a more well-thought-out impressionistic painting style and lighting effect. Ensor also made a series of etchings of Ostend and environs. The Main Dock, Ostend (1888) is a striking illustration of this: a view on the first merchant dock, the Kapellebrug, with the second merchant dock behind it, the present-day Mercator yacht harbour. In 1900, Ensor took up the tableau again and rendered it in The Docks at Ostend.